Blurb: Journalist Memphis Zhang isn’t ashamed of her Wiccan upbringing—in fact, she’s proud to be one of a few Chinese American witches in San Francisco, and maybe the world. Unlike the well-meaning but basically powerless Wiccans in her disbanded coven, Memphis can see fairies, read auras, and cast spells that actually work—even though she concocts them with ingredients like Nutella and antiperspirant. Yet after a friend she tries to protect is brutally killed, Memphis, full of guilt, abandons magick to lead a “normal” life. The appearance, however, of her dead friend’s attractive rock star brother—as well as a fairy in a subway tunnel—suggest that magick is not done with her. Reluctantly, Memphis finds herself dragged back into the world of urban magick, trying to stop a power-hungry witch from using the dangerous Flower Bowl Spell and killing the people Memphis loves—and maybe even Memphis herself. 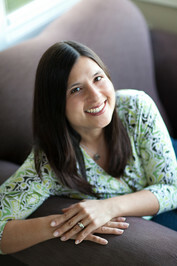 About the author: Olivia Boler is the author of two novels, YEAR OF THE SMOKE GIRL and THE FLOWER BOWL SPELL. Poet Gary Snyder described SMOKE GIRL as a "dense weave in the cross-cultural multi-racial world of complex, educated hip contemporary coast-to-coast America...It is a fine first novel, rich in paradox and detail." A freelance writer who received her master's degree in creative writing from UC Davis, Boler has published short stories in the Asian American Women Artists Association (AAWAA) anthology Cheers to Muses, the literary journal MARY, and The Lyon Review, among others. She lives in San Francisco with her family. To find out about her latest work, visit her website. I'm happy to be a book blogger. There are so many books to read and authors to learn about and meet. And there are also the reading experiences I have. Some books catch me off guard. I may base an opinion by its cover or blurb but once I dig into the story, I change my mind. 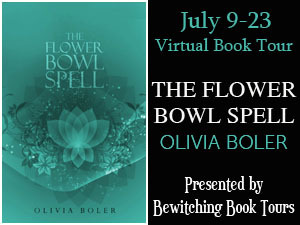 The Flower Bowl Spell is such a title. This book is a gem--one of those 'special' books I find by participating in book tours. I wasn't crazy about the cover but the blurb totally piqued my curiosity. Author Olivia Boler captured my attention from the opening page with main character Memphis Zhang's voice. Part snark/part humorous and a way bit over her head, Memphis (got to lovvvvve her name) grows on the reader until she feels like a good friend. Her world is like ours, contemporary, except for the flying fairies, ducks that knit, and demons that send greetings while posing as video game characters. Memphis' magical world is refreshingly offbeat and zany and honestly, I wouldn't have it any other way. I never knew what to expect page to page: the funky characters (a preacher named Jesus Christ), the situations (a cat with a bomb), the changing sets (CA towns), this story is a fun trip of a read. There is a wide cast of characters and I never needed a scorecard to remember who's who. Memphis was raised a Wiccan but stopped practicing until recently. Fairies in the subway and in her apartment made her change her mind (they would make me change mine too). She's a music writer and after her piece on a rising rock band is printed, she's asked to tag along with the band on tour as their biographer. Before her trek, an old Wiccan friend literally drops her two young daughters off at her doorstep, and leaves. Job, babysitter, lapsed Wiccan--Memphis has her work cut out for her. But things get really weird in the world of magick when witch friends turn up dead, Memphis has no choice but to begin practicing again. As she tries to figure out what's happening, her steady relationship with live-in boyfriend Cooper is tested by singer Ty, her childhood best friend's older brother. She feels a charge when he touches her and then, when he kisses her.... Well, I guess you'll have to jump into Memphis' book to find out what happens with Ty, Cooper, those fairies and everything else. The story moves along at a steady pace and Boler's writing has a nice style to it. Memphis has a unique viewpoint and her choice of words made her even more interesting. The world of magic and witches, though the genre and characteristics have been overdone, the author infuses enough of her creativity and imagery to stamp her own unforgettable mark in the paranormal market. With her Buffy-esque snark, Wiccan spells and magical mysteries to solve, Memphis is a contemporary Tabitha from Bewitched. 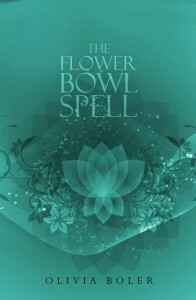 The Flower Bowl Spell will bewitch and entice fantasy and paranormal fans. Highly recommended. Rating: 4 **** Really enjoyed this. Cover comment: Please, get a new cover for this! Try to capture some of the magic found inside the book on the outside and then I bet fans will flock to this. I'd love to catch a side glimpse of Memphis' face with some of the quirky characters and items from her story in the background. Book source: I received a promotional ebook copy of this novel from the author for my honest review to be posted during a book tour. Thank you so much for the ebullient (I'm trying to expand my adjective bank) review! I love that you love the book. As for the cover, here's the story: I'd asked my cover designer (who is herself a student) if it was possible to find a cool picture of a girl, but she was working for, ahem, peanuts practically, and couldn't come up with one we could afford. Thus, the magickal lotus blossom design, which I love. But definitely will be on the lookout for other ideas for the sequel and YA prequel. Thanks again!